The aim of this website is to disseminate knowledge on the benefits of involving parents in plurilingual and intercultural education. Working with parents as partners facilitates not only language acquisition, but also the development of positive attitudes towards otherness, attitudes which are necessary for the harmonious development of individuals and society. 12 items found for "Show all items"
The EuroSign Interpreter project fits into a pan-European process of recognition of national sign languages as minority languages. The aim of this project is to develop resources to teach sign language to sign language interpreting and the finished module will be made available online. It is also a singular module (opposed to an award bearing programme) that will allow other Universities and training centres to incorporate it into their current interpreting programmes. Available in English and Polish. Dicta-Sign is a three-year EU-funded research project to make online communication more accessible to deaf users of sign language. SignSpeak is an innovative initiative to improve communication between the signer and hearing communities through vision-based sign-language interpretation technology. Available in English, French, German, Dutch and Castilian. European Union of the Deaf is a not-profit European non-Governmental organisation comprising National Associations of the Deaf (NADs). It is the only supranational organisation representing Deaf people at European level and is one of the few ENGOs representing associations in all 28 EU Member States, including Iceland, Norway and Switzerland. Aiming to establish and maintain EU level dialogue with the European Union institutions and officials in consultation and co-operation with its member NADs, it also has participatory status with the Council of Europe. Produced as part of the MEDISIGNS project, this research-based documentary explores issues of access to healthcare by the deaf community and the obstacles they encounter from healthcare professionals arising from their lack of understanding of deaf cultures, signed languages and working with sign language interpreters. Available in English, Swedish, Greek and Polish. This project represents a ground-breaking initiative focusing on identifying competencies for sign language interpreting in legal settings and providing training for both qualified and qualifying signed language interpreters in this domain. In JUSTISIGNS, legal settings is referred to in a generic context referring to the court room, interactions with solicitors, barristers and lawyers and also interactions of deaf people with the national police services. The digital platform favours the learning of sign language and is coordinated by a consortium of three universities: Blaise Pascal from Clermont-Ferrand, Paris IV Sorbonne, and the University of Strasbourg. 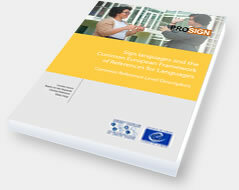 The book “Sign Language Legislation in Europe” is the first comprehensive study of laws relating to sign language. It covers all legislation in the European Union that mentions sign language. The World Federation of the Deaf (WFD) is an international non-governmental organisation representing approximately 70 million Deaf people worldwide. It is estimated that more than 80 percent of these 70 million live in developing countries, where authorities are rarely familiar with their needs or desires. This thematic and geographic overview examines more than forty sign languages from around the world. It begins by investigating how sign languages have survived and been transmitted for generations, and then goes on to analyse the common characteristics shared by most sign languages: for example, how the use of the visual system affects grammatical structures. The final section describes the phenomena of language variation and change. Drawing on a wide range of examples, the book explores sign languages both old and young, from British, Italian, Asian and American to Israeli, Al-Sayyid Bedouin, African and Nicaraguan. Written in a clear, readable style, it is the essential reference for students and scholars working in sign language studies and deaf studies. Sign Me English - the first website in Poland for hearing-impaired people - is a project that was awarded the European Language Label in Poland in 2013. It serves as an educational tool for teaching English and the culture of English-speaking countries. Websourd-media is the first news website in sign language.